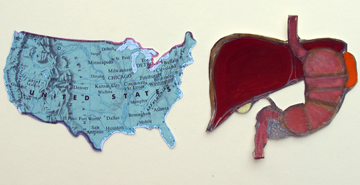 Making a map, reconstructing a map, playing with the idea of a map…this is what I’m doing. A city, a living organism, the bigger picture…this is what I’m thinking. Liking all the crazy detail coming forward. It’s new work for an upcoming exhibition at downtown’s Regular Gallery. Phoenix New Times Amy Silverman and Claire Lawton invited me, and 9 other artists, to create a Map of Phoenix. This weekend I’m setting up the map’s Legend. It’s occurs to me very late last night, I probably should have done this first. Legend, I’ve learned, comes from the Latin, legenda, “things to be read.” Maps inform by using symbols. A map’s legend tells you what the symbols mean. In the case of my map there are the usual practical map symbols…city street, interstate, park…and then on top of that is alteration and abstraction, implying something else. I not only want to layout Phoenix, I want to point to a larger idea. If I set the legend up right, there will be no need for an artist statement. It will not only lay out what I’ve done, but why. Regular Gallery, Greg Esser’s new art space, is small and intimate. Artist Lisa Marie Sipe’s new work, is personal. Combine the two, and you have a perfect match. The show resulted from the very personal experience of losing someone you love, to cancer. This is not the subject Lisa planned to deal with, but it’s the matter that presented itself. I find the work rich and full. And as I move from piece to piece, I wonder if Lisa immersed herself in trying to make sense of it all. I’ve visited a cancer research lab, and I recall slides of the various cancers where color is added and images appear beautiful. But it’s cancer. I find myself talking to Lisa about the experience that led up to making the work for the solo. She shares some thoughts, and I do too. No answers, no philosophical draws, just human exchange. Her work is key for that door. One is not supposed to touch things in a gallery setting, but I do want to touch. Things are bright, delicate, and so richly textured. I get very close to the work, to see it. I ask Lisa about her process and materials. She gathered images and printed them out on paper, using both sides of the sheet in some instances. Then she began construction. If you are familiar with Lisa’s work, you know she works in encaustic. But this is all very different. There is the wax, and color, and fluid design usual in her art, but these are more than 2 dimensional pieces. Though most of them hang on the wall, they have form, depth, and illusion of movement. She speaks about finding the new approach freeing. She shares how normally she has end result clear in mind, and knows what things will look like. This time, she wasn’t certain about anything. The comment brings back the subject at hand. Go see Girl Plays in Radioactive Dirt. Visit Lisa’s website for complete artist statement and some great shots of her work and the installation. Outside I chat a bit with artist Kate Timmerman, who is also visiting galleries this afternoon. Kate quickly says, I’ll be making phone calls soon, and this saves me a phone call! Do consider voting for Greg Stanton. She talks about several of his causes including funding for the arts. Very good, Kate. I drop into a few more galleries, talk to a few more artists…and now as my day comes to a close, I still feel invigorated by our artist community. The space is off the beaten path, so be sure to look for the entrance at the back where there’s plenty of parking. A few weeks ago (April 11th), I wrote about collaborating on an art exhibit, with three other artists. Yesterday, the four of us met with Kim Larkin. Modified Arts, will host the exhibition. Modified is run by Kim Larkin and Adam Murry. Kim made the round of studio visits, and then agreed to meet with the group on Saturday afternoon. Adam stepped in to greet everyone, and then he was off. About the space…it appeals to all of us. It’s open and well-lit. It has cool sophistication and yet it retains its original charm. It’s in downtown Phoenix. And it has lots of history. We do talk a little bit about the history of Modified. And then Kim speaks about their vision as the new directors of the space. She’s grounded. Intelligent. Clear. Flexible. I had these thoughts, when I spoke to her in my studio, and listening to her in this meeting, I am aware of them again. She has a sense of integrity we all connect to. I especially like that we discuss the exhibition as a whole experience. Kim brings up the idea of a community component. This is in perfect alignment with our plan. We’re in agreement about connecting with /interacting with/and pulling in the audience. We want to make the experience accessible and inclusive. Ideas tossed about: showing the creative process through photos, personal material (studio ephemera, studio debris), speakers, event/s, video, and music/sound. How this part evolves, you’ll have to wait and see, just like us. There will be one large, main artwork from each of us. And a few smaller supporting works, that specifically accompany the larger work. Included is the showing of process, in a more personal manner, will be bits and pieces from each. Kim mentions bringing fun into the equation. We agree…it’s present already, it will naturally be a part of the end result. WHEN will all this fun peak? I am really pleased to say…next year, during Art Detour. Feb 18th- March 12th. We note to Kim that we plan to reveal the other 3 artists, one a time. She’s good with this. But as I write this…I’m not so good with it. I want to tell you who the other artists are right now! Another clue below…..can you guess? Obviously…four women. I hope soon to reveal one of the other artist. We play around with shooting photos and then our afternoon meeting ends. I leave feeling the agreement to create this experience is respectful and beneficial, to each of us and our own individual process of working. Kim offers the gallery, Modified, and we offer our work. In the agreement there is plenty of freedom to really create. It’s the thing that is driving this show. EXCITING. Win-win for all, including you, if you’re inclined. WHO: 4 Women Artist. More to come soon. Today I offer the first glimpse of a creative collaboration that I am excited to be writing about. Involved are three other artists. Here begins the first formulations of what will be a future art exhibition. The group of four has come together for specific reasons, most important is that we want to work together. Working together is a bit more involved than merely showing together in an art exhibit. It includes a systematic series of actions directed to some end. What is the end? Simply put, it’s the creative experience itself. Certain criteria underlies the procedure of coming together. The artists are mature in their work, with a certain level of ambition still very palpable in their art. Not one of us can call ourselves an “emerging” artist anymore. There’s experience present, singularly and collectively. And though there hasn’t been a “merging” within every arena wanted, everyone’s on it, in their own way, be sure of this. Each has an MFA. With this footing, a level of tenacity and self-awareness is implied. Each person can draw, though each of us handles the ability in a very different manner. Everyone relates to the education process as a student, and as a teacher. And each person’s sensibility stands out as unique and precise. You see the individuals hand in the individuals works. There’s unmistakable presence of time, be it fast and quick or slow and steady. And evolution is a constant. The evening’s conversation bounces around, as we share a meal. Discussion involves how we proceed in making art. Process will be a part of the exhibition so this discussion is important. How does one begin a work of art? Is end result in mind? I listen to each response, there’s overlap in conversation, excitement, agreement, curiosity. I hear how different everyone is, in some external sort of way. I do note a more internal form of connection as well. Conversation continues. What do you listen to while in studio? This one element is important to everyone, so much so we discuss it at various points in the evening. Someone asks if the impetus to create is retinal or cerebral? Interesting choice of descriptive words. It’s retinal, they’re in agreement. I pause to consider. I can’t answer easily. Intuition, instinct, a strong understanding of the elements of design, confidence in the process, materials, adventures, age, personal interests…we’re talking about all of it. One spouse contributes a comment that gets our attention. It appears to me, you all solve problems. One person voices appreciation. We all agree with the observation. Here it is, in a nutshell. We’re working together, yes. There are four of us. We may have a venue and a general time line. The whole picture isn’t clear…yet….but we do see it happening. It’s retinal. What do we call the exhibition? It’s important that we get this. It’ll determine various specifics. This evening we’ve each brought along something. Some thing we work with; tool, material, a bit of process stuff. The symbol is a jumping point to help formulate a working title. I enjoy the discovery, the sharing. We throw words around. Out comes Webster’s Encyclopedic Unabridged Dictionary , and I begin to read. Process – operation. PROCESS. PROCEDURE. PROCEEDING. Apply to something that goes on or takes place. A PROCESS is a series of progressive and interdependent steps by which an end is attained. PROCEDURE usually implies a formal or set order of doing a thing, a method of conducting affairs. “That’s it! I like that!” One person calls out. Though I’ve not finished reading the whole thing, with similar excitement, everyone agrees. The working title of our project becomes What Goes On and What Takes Place. Here, you have the Why. I’ll fill you in on the Who these other artists are and the Where, and When the exhibition will take place, and a few other important details. Bit by bit, time will reveal. After all, the creative experience, is what it’s all about. This collaboration is a building of trust in the process, as we each continue to make art. P.S. this is way better than any reality show. Peeking into Five 15 Gallery, in downtown Phoenix, I recognize Mary Shindell’s work. Slim, vertical sculpture fills the center area, small 2D work lines the walls. I catch a glimpse of Mary at the back of the long, narrow space. The gallery isn’t open. It appears she may be completing the install. I am tempted to knock on the door but I decide against it just then. I don’t want to interrupt her and anyway… I would want time…to really look at her work. If you’re familiar with Mary’s art, you know it’s captivating. Her drawings and sculpture are based on the landscape that surrounds her, the Sonoran Desert. Planning to spend an afternoon, in the new year, to catch this exhibit of new work. Open every Friday 5-9 p.m.
For more information about Mary’s work, visit her web site at www.maryshindell.com. Artist Kate Timmerman is having a solo exhibition, opening the 3rd Friday in November, at Modified Arts. Kate is a mixed media artist who works with materials like wax, pigment, wood, plaster, lead and steel. This exhibition will look at themes of creatures, desert botanicals and text abstractions. You’ll see realistic portrayals of bonobo chimpanzees in oil and encaustic, and more abstracted creatures richly constructed with layers of pigmented wax, influenced by outsider art. Timmerman includes botanical works that are distorted and sculptural. Kate’s references range from personal issues of identity to broader political and social topics. When: Opening Reception Friday, November 20th, from 6-9 p.m. Artist Reception December 4, First Friday. *The gallery will also be open Nov 21, Dec 5 and Dec.12th, 1-5 pm. In addition, visitors will also have the opportunity to enter a lottery to win one of Timmerman’s paintings with a donation of pet food for the benefit of Poverty’s Pets. Poverty’s Pets is a downtown Phoenix group that rescues, neuters and places animals. Kate will be accepting pet food donations throughout the run of the exhibit. The drawing will be held on the last day of the show, Dec. 12th. For more about Kate’s work visit kdtimmerman.com. When: Friday, Oct 16 6-9 P.M.
Cuban born artist, Alfredo Manzo Cedena’s new work is influenced by recent health challenges. Brain cancer and ensuing aggressive therapy will be the focus of his upcoming solo at downtown’s Modified. Though he has been sick throughout this process, he has managed to complete a number of works for this showing. I suspect it will be. I want more photographs of both their work, and I want more detail. Carolyn’s response…come by on Friday night and see the work in person. Talk with Manzo. He doesn’t speak much English yet, so if you meet him you can use your Spanish with him. For more info contact Kimber Lanning at 602-312-4203.